Elevating hoppers are parts storage hoppers that are designed for ergonomics and to reduce the risk of injury to workers. These elevating hoppers raise up to the feeder bowl after they are filled. This prevents a worker from needing to fill a hopper that may be located above their head. Depending on the system, an elevating hopper could be extremely beneficial, while also increasing production. Elevating hoppers, like all parts hoppers, are used to store the bulk components that feed into a vibratory feeder bowl and to maintain a constant level of those parts in the bowl. 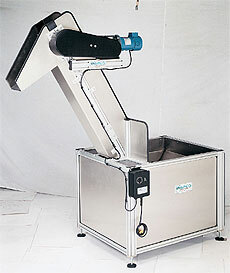 Our elevating parts hoppers are custom manufactured in-house out of hot rolled or stainless steel. Medical and food grade steel is available. Elevating parts hoppers can also be tooled to feed a simple part with minimal orientation. For further information or a free quote on elevating hoppers, contact Dial-X Automated Equipment, Inc.